Boss: 19:00 and 19:30 Server Time. We do boss 3/5 everyday respectively. Might Requirements : 250K+ Might. Line Chat : Line Chat is our primary means of communication, and all members are required to be on it. Torch battle: Max rewards every week. Lava 4 and IS: Lava 4 and IS is run throughout the day, and our guild system allows even new members to complete all their runs successfully. Lost Realm Bosses: You will never lose on these again. Fortress Feud : Details will be provided after you join guild. 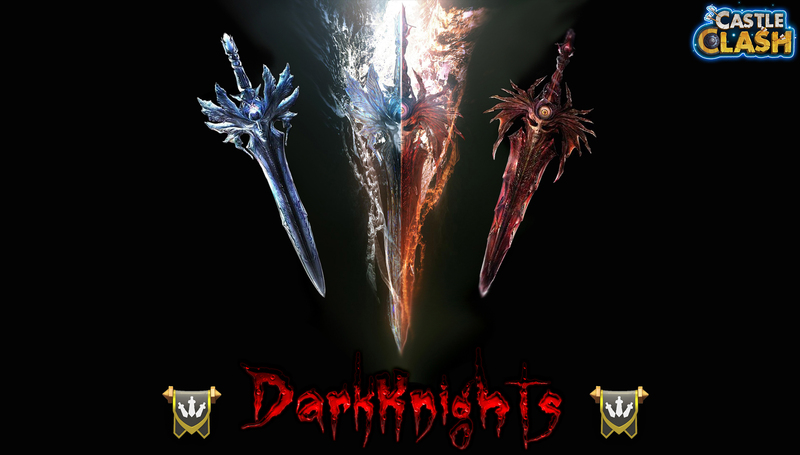 DarkKnights is an active but relaxed guild. We don't take the game as seriously as some of the other guilds, but we do enjoy being competitive. Our GW minimum of 3100 is very forgiving considering the level of competition we face. We have a strong GW and TB record due to our participation and cooperation from our guild members. All 250k+ might players are welcome to join. We don't have a lot of strict rules and requirements, but the few rules we do have, keep participation fair, and chat enjoyable. Our goal is to bring casual but competitive clashers together. We don't want a clan full of wannabe leaders who think they know everything. We are seeking mature players who aren't worried about titles. We want our members to play how they want. Rush, or don't rush, it's your game. Anyone is welcome to join us, and see if they fit in. However, we are ultimately looking for members interested in staying with the guild for the long haul. DarkKnights invests in its members, and expects the same in return. If you're interested, make a request to join by contacting us through LINE or comment below. Great guild here guys. Check us out. We use line to communicate about castle clash. Always helpful with advice and tips for our fellow members. First time posting in my life, so bear with me! I am DiBee, 163,902 might Skull Knight, 2evol, 171, 9/10, Bulwark 7/8 Santa Boom, 2evol, 155, 9/10, Revitalize 4/5 Destroyer, 2evol, 154, 9/10, Bulwark 5/8 Spirt Mage, 1evol, 181, 9/10, Bulwark 8/8 Ghoulem, 1evol, 181, 9/10, Revive 5/8 Moltanica, 1evol, 178, 8/10, Scatter 7/8 Vlad Dracula, 1evol, 173, 9/10, Rivitalize 4/5 I have all the heroes in cards x 5 to 12 in some cases. I currently have a Guild named Victoriosus but not going anywhere with it. I will be disbanding it as soon as I have the right opportunity. I wish to be a member of a world class Guild. The only "demand" would be to have a Boss Challenge at 21:00 game time. About me: I am a 54 yo business owner with limited but dedicated time to the game. I have been playing for 2 to 3 years. I'm active everyday only have 88k might. Try my best at torch boss and ff. Line GraveLords.looking for a guild to help me get stronger. Have every hero but artica. If you are looking for a strong fun guild. You have found your new home. To paraphrase BA Baracus "Only a fool don't join this guild." I'd like to join. 20:00 is 8:00pm EST right? This is a guild that focuses on each individual player. Everyone here at Darkknights doesn't just focus on the progress of moving upward, but also focuses on each individual player. Everyone is created equal and valued here and we leave no player behind in encouraging and uplifting them. We only are as strong as our weakest link. Come join us today and let us show you how much we care about you and your account. Awesome Guild, very helpful, Lava, FF, Guild Wars, everyone is dedicated. Join DarkKnights! !